To be honest knowing that Ketan Bhagat was the brother of Chetan Bhagat killed my anticipation for the book. Well I agree Chetan Bhagat has brought Indian youth back to reading but being a reader myself I am less than impressed with his writing. 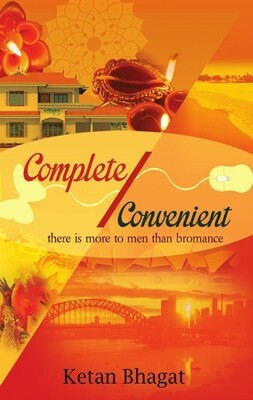 So one can imagine my surprise when I found myself actually enjoying Complete/Convenient. He is all that Chetan Bhagat is not in a positive way, and that is saying a lot. My only qualm about this book is that it could be a hundred pages less. It is so lengthy that I found my attention wavering. What I liked about the book however that unlike books belonging to popular fiction category it was not a typical drama but it successfuly touched the heart by its simple writing. It is a book you can easily relate to. You dont really have to be super intellectual to be able to comprehend it. What is a total dampener is the sheer length of the book but it is a book you will definitely not keep it down till you finish it. The characters have been sketched out perfectly and they assume a definite form as the story progresses. The characters are inspired by real life people hence easy to relate to. You realize that the author has been observant about life and people to derive at a conclusion. Human relationships are the soul of the story and they touch your heart time and again. What I appreciated about the book were the transitions in the story which were smooth. From Mumbai to Delhi to Sydney and then the story moves back and forth in the book but you will not lose the track; which worked for the book. Pick this book up because it is a well written book and a debut author needs all the encouragement! Do read it without any pre-conceived notions. @Elif_Safak Why I have come to love her!